Learn how to make a healthy smoothie with these 3 simple steps. 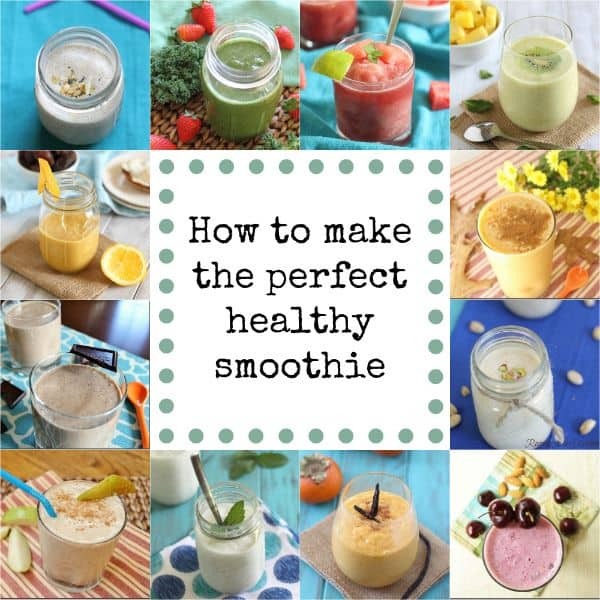 The perfect healthy smoothie is simple to make so you can enjoy one all the time! Happy 2014! I’m betting 99% of us are waking up today thinking, “time to start eating better again”. No? I don’t really do resolutions and I certainly have no arbitrary “lose ‘x’ amount of pounds” goals in mind, but I definitely wouldn’t mind a cookie/holiday treat detox of sorts after the craziness of the last month. And when I’m in the mindset of getting my nutrition back on track, healthy smoothies and I become bff. They’re quick, easy and can be a nutritional powerhouse if you know how to make them correctly. This tutorial on how to make a healthy smoothie walks you through 3 simple decision making steps for each part of the process. From choosing your base to adding your fruits and vegetables to all the fun extras – making a healthy smoothie shouldn’t be hard. With this knowledge in your back pocket you’ll be enjoy healthy smoothies of all kinds for a long time to come! Check out all the smoothie recipes on my site for some inspiration to get you started! For 1 serving, you’re going to want about 1-1 1/2 cups of a liquid base. Milk // good old dairy milk is always a solid choice if you have no sensitivities. It’s packed with protein so you don’t necessarily have to add that back in later. Coconut milk // Full fat coconut milk from the can is one of my favorite non-dairy options. If you’re using it as your only liquid, stir the cream into the water to get a more milk-like consistency. Almond milk // If you’re buying a non-dairy almond milk in the carton, go for the unsweetened original flavor. It’s much better to add your own level of sweetness from natural sweeteners to the smoothie later on. Greek yogurt // Another protein packed liquid option that creates a great smooth texture. Fruit juice // Not feeling the milk base? Go for some natural fruit juice! Orange juice is one of my favorites, but any fruit juice will do. Keep in mind these are much sweeter than the milk bases so you’ll definitely want to be mindful of your fruit & sweetener add-ins later on. When it comes to vegetables, it’s hard to say there should be a limit, but for 1-1 1/2 cups of liquid, 4 cups of packed greens is usually a good ratio. If you’ve used fruit juice as your base, you may not even want any additional fruit. If you’ve used a milk as your base, 1 cup of fruit is a good amount. Spinach // Do we really need to even talk about how good for you spinach is? Loaded with vitamins K, A, iron and with virtually no calories…yeah, it’s pretty awesome. So get over the “ew, my smoothie is green” thing and throw some in. Seriously, it will blend away to nothing and you won’t taste a thing. Kale // Now, kale on the other hand, is for those a little less freaked out by the green thing. Kale has a bit more prominent flavor than spinach and unless you have a high-end blender, chances are you’re going to taste the gritty texture from it. I have a Vitamix (<—can’t recommend this thing enough!) which blends the shiznit out of whatever you put into it so kale isn’t a problem, but just beware if you’re rocking an old school blender. Similar to spinach, kale is also packed with vitamins K, A and C.
Berries // No need to go through them all, any berry makes a great addition to your smoothie. Frozen wild blueberries are a personal favorite as they’re packed with even more antioxidants than a regular blueberry. Frozen berries are a great option for winter-time smoothies when nothing is in season and as a bonus, they add a bit of “iciness” to your smoothie without having to water it down with actual ice. Bananas // Unless you’re adverse to them for some reason, bananas are a great smoothie staple. With a milk base, they’re the perfect natural sweetener. With a fruit base, they provide some staying power the other fruits don’t necessarily give you. I always, at minimum, throw 1/2 a banana in mine. Now for the fun stuff! The extras are where you make your smoothie “yours”. From sweeteners to flavor enhancers to nutritional boosts, this is your chance to play around. Protein powder // If you haven’t used a milk or yogurt base and want some protein in your smoothie, whey protein powder is a great option. I keep vanilla and chocolate Designer Whey on hand and add anywhere from 1/2-1 scoop to my smoothies. Nut butters // Another great way to get some protein (and good fat) in is nut butters. Peanut, almond, cashew…take your pick, they all work wonderfully. Chia seeds // These little guys are filled with omega-3s and a decent amount of protein per serving. A tablespoon is a great little boost to any smoothie. Ground flax seed // Another omega-3 packed option, flax seeds are also a good source of fiber. Make sure you choose the ground or milled kind because our bodies can’t absorb the nutrients from the whole seeds themselves. Oats // Want some staying power to that smoothie? Adding oats makes your drink more of a meal and will thicken things up a bit. Medjool dates // Dates are really nature’s candy. If you need some sweetness, these are your healthy go-to. 1 or 2 pitted ones will do the trick, just make sure to blend really well to fully incorporate them. Extracts // Vanilla, almond or any other pure extract is a great way to get some flavor into that smoothie without calories or bulk. Can’t go wrong with 1/2 a teaspoon or so of one of your favorites. haha, here’s to non-watery smoothies in 2014 ;) Happy New Year to you too! Happy 2014! Thanks for this simple formula. I got a smoothie maker for Christmas and have been looking for ideas. I’m tired of buying them at Jamba. :) Saw this on G+ and appreciate the post. This is such a great post, Gina. I’m ready to make some smoothies! Pinned. Wow thanks for the smoothie handbook :) Love it. Mine was definitely more of a guacamole color, but yummy nonetheless. Love this, Gina! Such a simple formula–my mind always goes to about a million things a smoothie needs (although fancy smoothies can be great too!) so I love this simple formula. Pinning! Great introduction to smoothies, I am about to order a blender and food processor and cant wait to get started with the smoothie business ;) your post is definitely a good start! Great description! I’m on the green smoothie train this month, that’s for sure. My goal is to have one every day for the entire month of January.